Astana the capital city of Kazakhstan is where the embassy of the British are located. Speak to the staff at the British embassy in Kazakhstan if you are a British national wanting to renew your passport, apply for a new passport or you need consular services such as registering a death, registering a British citizen born abroad or registering your marriage at the embassy. You can also apply for a visitor visa for the UK or a marriage or fiancee visa if you have a husband or wife who are British nationals. 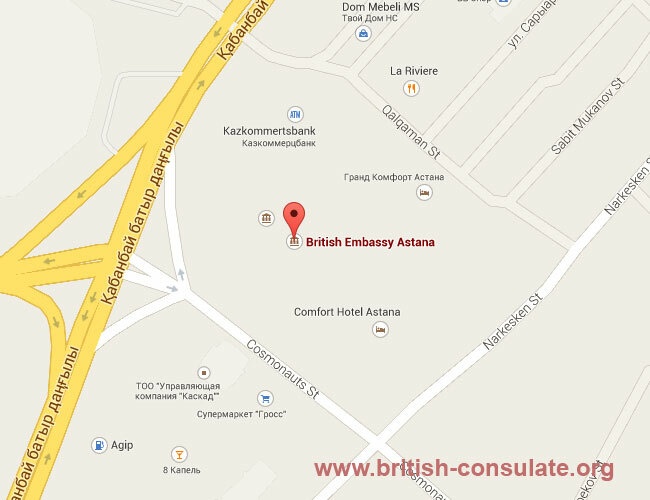 Note the contact details below such as address, email and also a map to the British Embassy in Kazakhstan.